A decade after observers doubted that Apple could take on efficient big box retailers with its own retail stores, Best Buy is seeking to survive by scaling down its store sizes. Its founder thinks that plan might be fatal. In July, Best Buy announced plans to close 50 big box stores in its global chain of more than 1,150, scale back floor space in remaining locations and slash $800 million in expenses over the next three years, while also remaking the chain to look more like Apple's stores. The chain's interim chief executive, Mike Mikan, has called its experimental new Apple-like store "Best Buy 2.0," with a new focus on ensuring customers can speak with employees who assist them, rather than displaying as many gadgets as possible. 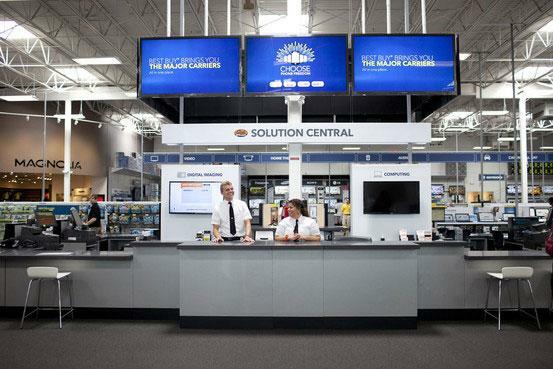 Best Buy's new "Solution Central" has been compared to Apple's Genius Bars. Photo via The Wall Street Journal. Best Buy's founder Richard Schulze believes the company's current cost cutting plans will put it out of business, however. According to a report by the Wall Street Journal, Schulze has floated plans to take the retailing giant private in a $10 billion buyout in order to focus on aggressively cutting prices to enable it to compete with Amazon, while also upgrading the chain's reputation for customer service to make it as attractive as Apple's own retail outlets. Schulze's plan would reverse parts of the "Best Buy 2.0" plans, but would also reduce profit margins, resulting in a "substantial run up in costs in the first couple of years that would be difficult for a public company to justify," the report stated. Large electronics retail chains have struggled to remain profitable, with CompUSA closing more than 90 percent of its 126 US stores in 2007 and Circuit City liquidating its last of its 155 US stores in early 2009. Apple's smaller format of stores, coupled with a limited selection of desirable products and personalized service, have grown to 373 stores in 13 countries, 250 of which are in the US. Apple has also partnered with larger conventional retailers, including Best Buy, Target and WalMart, to develop "store within a store" locations as dedicated retail areas.